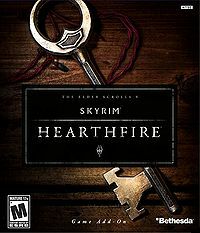 Hearthfire is the second major official add-on for Skyrim. The add-on allows the player to build (from scratch) up to three unique homes. The add-on also introduces adoption, allowing the player to adopt orphaned children. Ability to build and customize your own house. You must purchase the land and use raw materials at a drafting table and carpenter's workbench to create rooms and furniture for your house. Equip your home with arcane enchanters, armories, forges, gardens, libraries, shrines, stables, taxidermy, and more. Three plots of land are available for purchase, in Falkreath Hold, Hjaalmarch, and the Pale. The structure of each house consists of stone, clay, and wood. Ability to adopt up to two children, who will move into your house. Interact and play games to raise your new family. Allow your child to keep a pet after it follows them home. Some creature followers can also be kept as a pet. If you wish to adopt children without moving into a new home, you may add a child's bedroom to an already purchased home in a major city. Turn followers into stewards, who can supply you with housebuilding materials, furnishings, and staff. A carriage driver who can take you to small settlements as well as major cities. A personal bard to perform at your home. New activities, such as baking, beekeeping, farming, and fishing. Requirement to protect your house from various enemies such as bandits, giants, skeevers, and more. All three of the new pieces of property can be purchased for 5000 gold. Heljarchen Hall — Located in the Pale, this plot of land may be purchased from the Jarl of Dawnstar in the White Hall. You will have to complete the quest Waking Nightmare, and then the favor quest Kill the Giant before being allowed to purchase the property if Skald is still jarl. (Note: This favor has a prerequisite of being level 22.) If you are thane of the hold, you will be appointed a housecarl named Gregor. It is located in the south of the Pale, not far north of Whiterun (you can see the castle in Whiterun from the house); the closest landmarks are the Tower of Mzark, Loreius Farm and Blizzard Rest. Lakeview Manor — Located in Falkreath Hold, this plot of land may be purchased from the steward of Falkreath in the Jarl's Longhouse. You will have to complete the quest Kill the Bandit Leader before being allowed to purchase the property if Siddgeir is still jarl. If you are thane of the hold, you will be appointed a housecarl named Rayya. It is located directly north of Pinewatch and very close by. 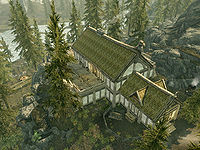 Windstad Manor — Located in Hjaalmarch, this plot of land may be purchased from the steward of Morthal at Highmoon Hall. You will have to complete the quest Laid to Rest before being allowed to purchase the property if Idgrod is still jarl. If you are thane of the hold, you will be appointed a housecarl named Valdimar. It is located in the north of the hold, not far south of Solitude; the closest landmarks are Ustengrav and the Abandoned Shack. Five new achievements can be earned after installing Hearthfire, listed on this page. Four new loading screens are added after installing Hearthfire, listed on this page. Hearthfire was subject to a 30 day exclusivity deal with Microsoft, where it was only available on the Xbox 360. As it turned out, it was released for the PC after 30 days, but due to severe performance issues, it wasn't until February 2013 that it was released for the PS3. Display cases are not the same as the ones in other houses, so they do not allow you the "place weapon" option. All areas of the player-built homes will reset to their original furnishings; only the storage containers and any items you drop from your inventory will be left as is. This allows storage in containers to be safe while respawning resources (e.g., the greenhouse) can replenish their stocks. Mannequins may experience duplication issues, regardless of which plot of land the home is built on. Sleeping in beds will not grant the Well Rested bonus, although if you have a spouse and/or children they will confer the Lover's Comfort and Mother's/Father's Love bonuses. A cooking pot in Proudspire Manor was removed. Mannequins will occasionally be displaced from their pedestals. This can be fixed by placing an item on the mannequin. It can then be taken off, and the mannequin will remain in place. When firing your bard they may not leave but stop playing and hang around your house. This bug is fixed by version 1.1.1 of the Unofficial Hearthfire Patch. Objects in some rooms may fail to render at certain camera angles if you have built a large percentage of the improvements for that room. They're still there, but just invisible. Wolf attacks may not work properly due to missing property settings in the game data. This bug is fixed by version 2.0.0 of the Unofficial Hearthfire Patch. When placing items in rooms, sometimes items that you've already created appear available on the workbench, and you can attempt to remake them (taking resources to do so), but will get nothing new. Exiting the menu may resolve this. Crafting items, such as glass, goat horns, and straw, may disappear from general merchants' inventory completely. The containers in the houses will not show stolen items in red, like all other containers. The only way to tell if an item in a container is stolen is to take it. It will show the usual marker in the inventory menu. Even if you have a pickaxe in your inventory, you may be unable to interact with the stone quarry or clay deposit. ? Some NPCs may not display their clothing. ? Huskies and death hounds may vanish from the house after becoming pets and will not show up at their original areas. ? Using the forge at your home may cause the grindstones and workbenches to become unusable. ? Reloading a save prior to using the forge will solve this. Dropping items from your inventory in some of the rooms will sometimes result in them disappearing completely. ? You may lose the option to hire a bard for your homestead if you purchase all of the other improvements first. This can be solved by killing your horse or cow, entering your home (and going back outside if your steward is outside). This should restore the option to hire a bard and buy replacements for your dead livestock. Note that it is advisable to hire the bard first, or you may once again lose the option to do so.